October 2016 - Patent my French! France is well known around the world for its baguette bread, strong cheese, good wines and frequent strikes. Turns out French IP also has clichés of its own, and one of them is probably the Soleau envelope. Although the general public does not necessarily know much about IP law, they have usually at least heard of this national institution. 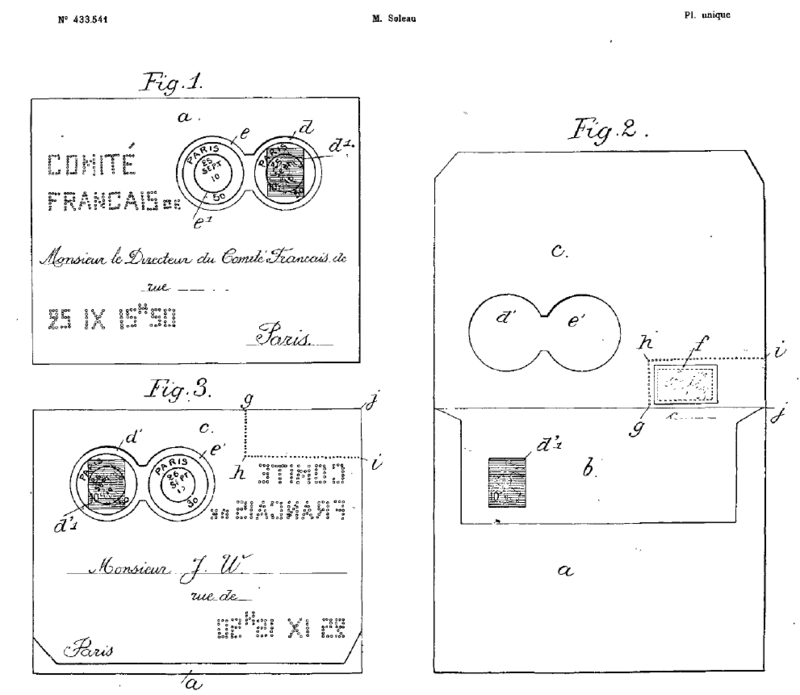 The Soleau envelope is a way to self-preserve evidence by putting any document in a sealed envelope and having it date-stamped and kept in store by the INPI (the French patent and trademark office). It is popular probably mainly because it is a cheap and easy process. But this comes at a price of a number of misconceptions (just like some of the other French clichés), as many people tend to believe that it is a lesser alternative to a patent – which of course it is not. The Soleau envelope had an inventor, Mr. Eugène Soleau, who quite interestingly filed and obtained… two patents for his invention. At least he knew better. One of the Soleau envelope patents. The case discussed today is relatively exceptional in that it is an example of a situation in which Soleau envelopes were actually useful in the end. There is yet another reason why the case is fairly exceptional: it relates to a claim for ownership of a patent, and the claim was successful – quite often the burden of proof on an ownership claimant is simply too heavy to be properly discharged. Mr. Courau is a specialist of pine resin extraction, which is a traditional practice in the Southwestern part of France. Resin extraction is performed by making an injury on the trunk of the tree. Resin exudation can be stimulated by spraying sulfuric acid on the injury, but this has obvious drawbacks for the environment and workers. According to the judgment, Mr. Courau has been experimenting the use of alternative resin exudation stimulating agents, comprising notably citric acid or sodium citrate, for a number of years. He filed Soleau envelopes describing his work in 1994, 1995, 2003, 2009, then on July 7, 2010 and finally on August 18, 2011. Between 2007 and 2012, he worked with the company Holiste Laboratoires et Développement, which specializes in aromatherapy. A confidentiality agreement was signed between them on July 7, 2010 (the same day as the fifth Soleau envelope was filed), and then apparently a collaboration agreement two weeks later. On March 16, 2012, Holiste filed a French patent application. This application was eventually withdrawn but a divisional application was also filed which matured into a patent. Holiste also filed a PCT application claiming the priority of the French application. Mr. Courau found out about these filings and sued Holiste in June 2014, claiming ownership of the patents / applications because, he said, the invention was stolen from him and the filings violated the 2010 confidentiality agreement. Holiste’s defense was that Mr. Courau was not the inventor of the patents / applications at stake. They said he had offered to replace the conventional acid stimulating agent by a neutral stimulating agent. The parties had therefore discussed a possible neutral composition based on sodium citrate, calcium carbonate and water. On the other hand, the invention at stake is rather about using citric acid as a stimulating agent. This concept was suggested by another technician (namely the person designated as the inventor in the French and PCT filings). 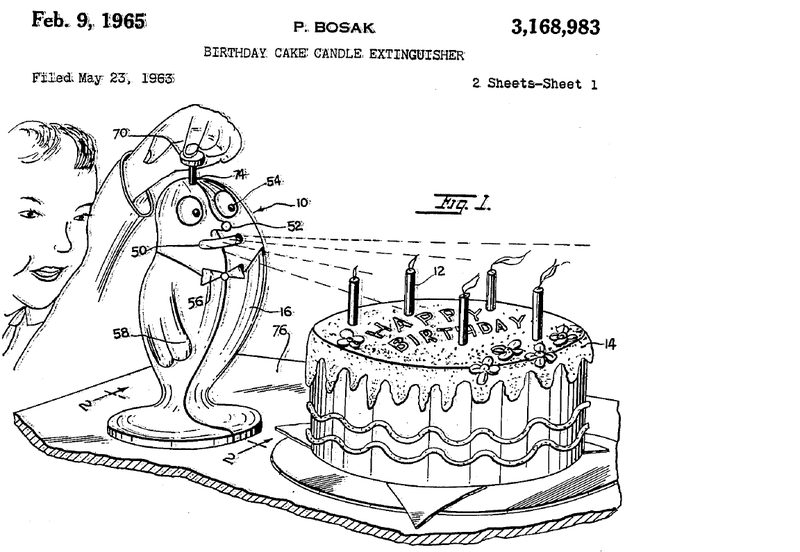 The court analyzed the claims and the description of the French patent. The main claims recite a solution containing citric acid or a derivative thereof for stimulating resin exudation. Various additives can be employed, including in particular a filler such as clay. The court then turned to the contents of Mr. Courau’s successive Soleau envelopes. In those dated 1994 to 2009, stimulating compositions based on sodium citrate are mentioned. As a reminder, sodium citrate is a salt of citric acid; when put in a solution citrate sodium will decompose and yield citrate (a base) and/or citric acid (guess what: an acid) depending on the pH of the solution. Anyway, in the later Soleau envelopes of July 2010 and August 18, 2011, citric acid per se is mentioned. Then the court reviewed the collaboration agreement of July 2010. The agreement defines confidential information exchanged in the framework of the agreement and provides that the recipient of confidential information from the other party has no right on (notably) related inventions. In a letter dated September 3, 2010 to Holiste’s designated inventor, the plaintiff had explicitly referred to “the neutral exudation paste which contains sodium citrate and the know-how necessary for its implementation” as confidential information under the agreement. Finally, the court took into account of number of email exchanges. In August 2010, Holiste acknowledged that Mr. Courau was the sole inventor of a new resin exudation stimulation composition. The filing of a patent application by Mr. Courau was planned after some additional testing, with a license to be granted to the company. In December 2011, Holiste further confirmed in writing that Mr. Courau was the inventor of the exudation stimulation composition. The court considered all the above evidence as convincingly showing that Holiste had indeed been disloyal and breached the agreement by filing a patent application on his invention. The invention was a solo invention made by the plaintiff. Claude Courau invented the composition of an exudation paste that he termed as “neutral”, not in a chemical sense (i.e. at pH 7) but in a common sense, meaning that it is not harmful for man and the environment, unlike sulfuric acid which was previously used. It cannot be concluded from the awkward use of this term that the product did not contain any acid. On the contrary, all documents mentioned above, which are dated prior to the patent filing, recite the presence of either citric acid or its derivative sodium citrate (which is obtained by adding soda). As a result, the court ordered that Mr. Courau be retroactively considered as the sole applicant of the French patent, as well as of the PCT application, “including patent applications originating from national phase entries thereof“. The plaintiff was also awarded 10,000 euros for moral prejudice as well as 8,000 euros for reimbursement of attorney’s fees. It seems that the claimant in this case was a very careful person, who had extensively documented his work or ideas over the years. This is not so common and is certainly the reason for the positive outcome that he obtained. I do wonder however whether the court sufficiently reviewed all the claims of the French patent. For examples, dependent claims 6, 7 and 10 recite the presence of clay as a filler, in particular bentonite or kaolin. Whether this embodiment was also communicated by the plaintiff to Holiste prior to the filing date is unclear as the judgment is silent on this aspect. Also, the PCT application contains a slightly different claim set, with some additional features. It seems to me that, if Holiste’s designated inventor contributed to at least some of the claims, the court should have ordered co-ownership instead of a full retroactive transfer of ownership. As a last remark on this case, the PCT application entered into European regional phase. This is not mentioned in the judgment, but of course the file wrapper is accessible online on the EPO website. In December 2014, Mr. Courau’s representative requested that the examination proceedings be stayed due to the pending ownership litigation. This request was immediately accepted by the EPO. Holiste’s representative countered by stating that the lawsuit was groundless and by directly attacking Mr. Courau. The legal division of course stayed miles away from taking position on the merits of the case but simply explained that the legal conditions for ordering a stay of proceedings were met. In July 2016, Holiste’s representative nevertheless filed amended claims to (oddly) align the European claims onto the French granted claims. Of course, this amendment could not be processed by the EPO. As a result, Holiste’s representative sent another letter in August 2016 expressing bewilderment at the EPO’s refusal to deal with the amendment. To be continued. The next steps in the examination proceedings will of course depend on whether an appeal was lodged by Holiste against this TGI ruling. CASE REFERENCE: Tribunal de grande instance de Paris, 3ème chambre 3ème section, May 13, 2016, Courau c/ Holiste Laboratoires et Développement, RG No. 14/09297. Few patents get famous enough to make it to the headlines of the general press. Some Apple patents are among them, such as those nicknamed “slide-to-unlock” or “rubber-banding” – especially thanks to the world war waged against Samsung. 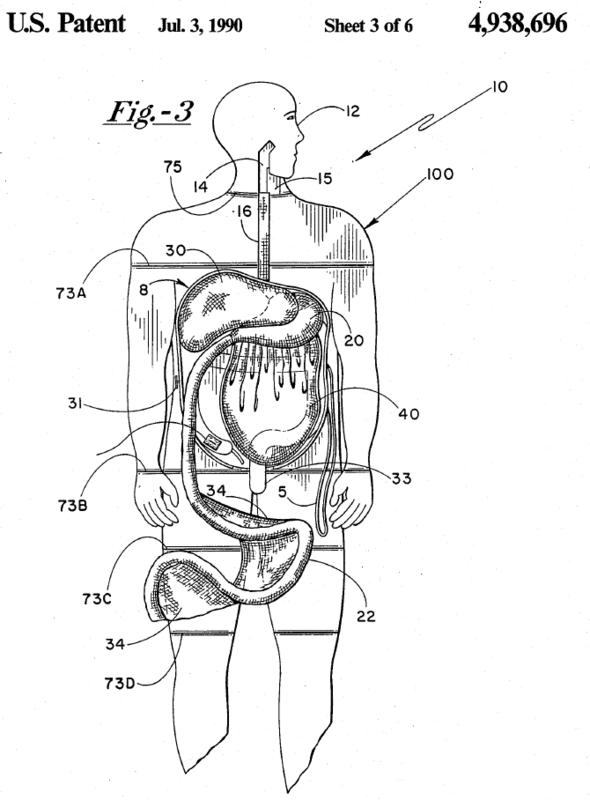 Other patent celebs include those on blockbuster pharmaceutical drugs. In this latter category, one patent family in particular has attracted some fuss over the past few years. It is the one which covers the drug sofosbuvir, marketed under the name Sovaldi. Blockbuster drug patents can even beat patents on blockbusters. Sofosbuvir has markedly improved the treatment of hepatitis C virus (HCV) infection. But in many countries, in the absence of any generic version of the drug, the price of HCV treatment has skyrocketed as a result. This has aroused vocal protests by a number of NGOs (see e.g. here). 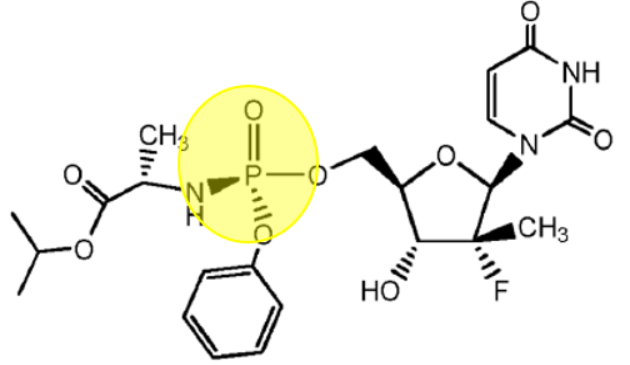 In Europe, the sofosbuvir patent (or at least one sofosbuvir patent) is EP 2203462, owned by Gilead. It was opposed after grant by ten different parties, including the NGO Médecins du monde, a number of generic manufacturers, and a number of straw men. Oral proceedings took place on October 4-5 in Munich. The only public information available as of today on the online register is that the patent was maintained in amended form. The minutes of the oral proceedings and the written decision of the opposition division have not been issued yet. Tufty the Cat has recently made assumptions on his blog regarding the claims which were uphed by the opposition division. I have now received a confirmation by someone who attended the oral proceedings that Tufty got the claim amendment right. But there seems to be some confusion, to say the least, after these oral proceedings. Indeed, Gilead and its opponents seem to have different views as to whether the amended patent still covers sofosbuvir or not. In order to understand how there can be such a controversy, it is necessary to go back to some basic notions of stereochemistry. There are many examples of chemical compounds having different 3D atom configurations although they share the same 2D chemical formula. These different configurations are referred to as stereochemical forms, or diastereomers, of a given compound. In the pharmaceutical field, identifying the different stereochemical forms of a compound is of prime importance, as diastereomers often have different pharmacological effects. By way of example, the so-called (S) stereochemical form of ibuprofen is a hundred times more active than the so-called (R) stereochemical form. Besides, such chemical compounds are generally not synthesized as stereochemically pure compounds, but as a mixture of diastereomers. It is often necessary to further purify this mixture in order to isolate the most active diastereomer. Gilead’s patent as granted contains six claims, including three independent claims 1 to 3. For once, let’s start with claim 2. This other compound looks very much like sofosbuvir, since it is its diastereomer. 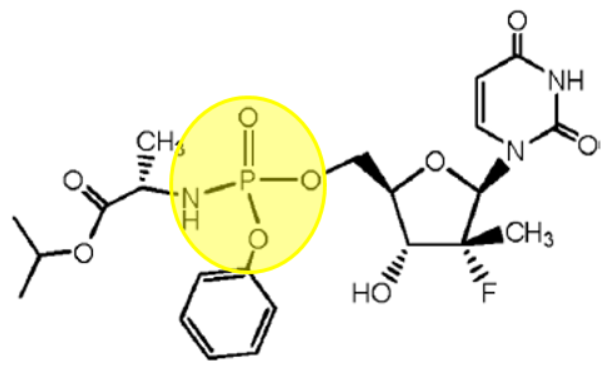 The difference between the two compounds is highlighted in yellow. 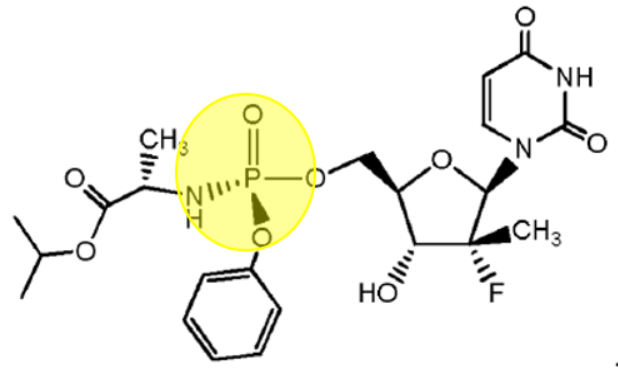 In the sofosbuvir formula, the P-O bond is shaded in black and the P-N bond is hatched, which means that, in 3D, the oxygen atom is in front of the phosphorus atom, while the nitrogen atom is behind. It is exactly the opposite in the diastereomer of claim 3. In this formula, the relevant P-N and P-O bonds are depicted as simple lines, which means that the 3D configuration is not specified. Claims 4-6 simply recite a composition comprising the compound of one of respective claims 1-3 and a pharmaceutically acceptable medium. According to my source, claims 2, 3, 5 and 6 were found by the opposition division to extend beyond the contents of the application as filed. As a result, the patent proprietor filed an auxiliary request in which these claims were deleted, and only granted claims 1 and 4 remained. The opposition division came to the conclusion that this auxiliary request meets all the requirements of the EPC, and made the interlocutory decision of maintaining the patent in this amended form. The decision should soon be issued in writing, and will be open to appeal by all parties. And now, here comes the conundrum. The patent as amended during first instance opposition proceedings no longer contains claims 2 and 5 which were specifically directed to the sofosbuvir compound and the sofosbuvir-containing medicament. The question is whether the remaining claims 1 and 4 still protect sofosbuvir and sofosbuvir-based drugs. One possible interpretation is that claim 1 is a generic claim which protects both diastereomers. It is broader than claim 2, and therefore the scope of the patent remains completely intact. 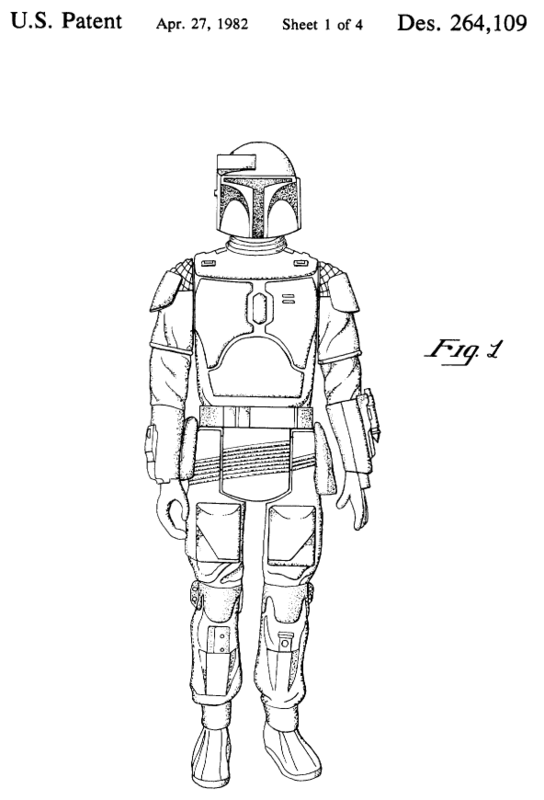 Quite frankly, I think this is the interpretation that most patent attorneys would consider as the most logical one. However, another possible interpretation is that claim 1 is directed to a diastereomeric mixture, i.e. a mixture of the compounds of claims 2 and 3 as granted. Arguments in favor of this interpretation could be that: claim 1 does show a 3D configuration in other parts of the molecule; thus, the absence of 3D information around the phosphorous atom means that such information cannot be provided, because both forms are present in the compound; furthermore, granted claims 2 and 3 are independent claims and do not depend on claim 1 which confirms that they are not particular embodiments of claim 1. According to this second interpretation, a generic sofosbuvir drug would arguably no longer infringe the patent – as the drug would not contain a diastereomeric mixture. It seems that the description of the patent does not fully clearly support one interpretation over the other. I could very well see a French court coming to the conclusion that since the claim specifically directed to sofosbuvir was deleted, the patent may not possibly protect this molecule any longer. Maybe the written decision of the opposition division will contain a position as to what claim 1 means. But then, maybe not. And anyway, any position that they may have taken is not binding on national courts. With that in mind, I would certainly not bet my life on either interpretation. Would readers be keen on taking a vote? I would like to thank my source for this hot information. I have also been told that a number of interesting topics were discussed during the opposition proceedings, in connection with extension of subject-matter, priority and inventive step. So we should watch for the written decision of the opposition division when it is issued. CASE REFERENCE: ongoing opposition proceedings against EP 2203462 to Gilead Pharmasset LLC. Happy birthday, blog. On October 17, 2015, this blog’s first post was published. I am looking forward to another year of blogging and I do hope to be able to publish a second birthday post – although no promises are made. Thank you very much Lionel Vial and Aujain Eghbali for your contributions up to now. You are welcome back on this blog any time. Other contributors are also welcome, even for a short message. Anonymous contributions may also be accepted. A few stats for those who are interested. At this point the blog has a little bit more than 70 email subscribers. Thank you all. The link for subscribing is at the bottom of the left banner. The blog has had approximately 13,500 page views so far. The best score ever was 628 views in a single day when Laurent Teyssèdre kindly mentioned the blog in a post of his own famous blog. Thank you so much for this huge publicity. The home page and some permanent pages are the most viewed ones. Other than that, the most popular post ever was the April fools’ joke on the UPC. Makes me think that I should quit reading case law decisions and start a career in hoaxes. Then, the next most popular ones are generally in the pharma field, this one being the winner. Unfortunately, the vast majority of search queries which led visitors to this blog remain unknown to the blogmaster, but a tiny minority are known (this all depends on which search engine is used as far as I understand), and it makes you realize that sometimes the search results must have been quite disappointing for the searchers. For instance, someone looking for a “patent for poison” was led to this post on poisonous divisionals; another person wanting to translate “the remedy may be worse than the disease” into French landed on a report by Lionel Vial on Merck v. Actavis; last but not least, a reader interested in “nice models” ended up on another (gorgeous) report by Lionel Vial, this time on disease models and their importance for the appraisal of sufficiency of disclosure. Would you like to read more about EPO case law? Or to read only about French case law? Should the posts be more succinct? Should I switch to French because no foreign reader can possibly have any interest in what is discussed here? Are there topics which have not been addressed yet and which should? Should my sentences be shorter and contain less passive voice as the blog editor keeps telling me? Comments and private messages are welcome. Enough celebrated. Let’s extinguish the candles right now. Sometimes, a case is not over even after it is lost. This is especially true when a defendant is found guilty of patent infringement but the amount of damages is not yet determined in the infringement ruling. It is then still time to continue fighting for damage control. And this can pay off, like in the present case, where the total damages award amounted to approximately 7% of what the plaintiffs requested. That is, if my math is correct because the ruling contains so many figures that it is quite easy to lose track. An example of not-too-bad damage control. The story started a while ago, more precisely in June 2005, when Hutchinson, owner of European patent No. EP 0691481 (on a connecting rod for vehicles), together with its subsidiary and licensee Paulstra, sued two companies, CF Gomma Barre Thomas and Paul Robert Industrie, for infringement of the patent. CF Gomma Barre Thomas entered insolvency proceedings later in the same year, so that the infringement proceedings continued against the court-appointed receiver. In 2007, after another infringement seizure, a third company was added as a defendant, namely Société des Polymères Barre Thomas (later renamed as Cooper-Standard France). In June 2009, the Paris Tribunal de grande instance (TGI) declared the patent valid but rejected all infringement claims. Hutchinson and Paulstra appealed. In October 2011, the Cour d’appel confirmed that the patent was valid but set aside the first instance judgment as far as infringement is concerned: claims 1, 2, 4 and 5 of the patent were held to be infringed. The appeal ruling appointed an expert for determining the amount of damages. A cassation appeal was lodged, and the supreme court judges partly canceled the 2011 judgment, because the finding of infringement of dependent claims 2, 4 and 5 was not sufficiently reasoned. However, this partial cancellation left intact the main findings of the 2011 judgment – in terms of validity of the patent and infringement of the main claim. This leads us to the second ruling by the Paris Cour d’appel in 2016, after the expertise, on the assessment of damages. Not exactly a fun read – unless you are an accountant, that is. But an important one, as this is the point at which the lawsuit finally has an actual impact on the various companies’ finances. 1. Negative economic consequences of infringement, including lost profits and actual losses incurred by the harmed party. 3. Profits made by the infringer, including intellectual, material and marketing investment savings deriving from the infringement. However, the court can alternatively, upon request of the harmed party, award a lump sum as damages. This lump sum is greater than the amount of royalties which would have been due if the infringer had asked for the permission to use the right that it infringed. This lump sum can be in addition to the indemnification of the moral prejudice. A first issue raised by the defendants was whether the above (current) provision was applicable or not, given that it was modified in 2014. In particular the notion of “intellectual, material and marketing investment savings deriving from the infringement” was not recited in the earlier version of the law. The court replied that the current provision is indeed applicable since the 2014 modification in fact did not change anything and did not add a new damages count; it is simply more explicit than the previous one. A second issue was the definition of the perimeter of the infringing goods. Four models of connecting rods were mentioned in the infringement seizure reports of 2005 and 2007. These models were clearly to be taken into account in the assessment of damages. But the plaintiffs contended that six further models were also infringing and should also be taken into account. This injunction, which guarantees that the monopoly right is restored to its state before the infringement, concerns the future and makes it possible if necessary to start further legal proceedings against an infringer who is then aware of the infringement. I have of course no idea whether the six additional models of connecting rods were similar or identical to the first four ones. But I think it is really a pity that the court did not find a way to rule on the additional infringement claim in this ruling (be it to hold that the new models infringe, do not infringe, or that there is not enough evidence of infringement). Telling the plaintiffs that they can start a new action does not seem satisfactory on the standpoint of efficiency, especially in view of the overall duration of the present proceedings. The rest of the decision is concerned with the actual computation of damages, plaintiff by plaintiff, defendant by defendant, and period of time by period of time. For the most part, the expert’s report was approved by the court. By way of example, the plaintiffs contended that some accessories, such as fixation means, should also be included in the calculation, in view of the well-known doctrine of the “tout commercial” (which could be translated as the doctrine of the commercial package). The court rejected the contention, because there was no evidence that the accessories were sold as a consequence of the sale of the infringing connecting rods. Paulstra claimed that it has suffered lost profits because they would have been able to make and sell all the connecting rods according to the invention marketed by the defendants. This point was accepted by the expert and the court. However, the margin to be applied to the lost sales in order to compute loss profits was hotly debated. Paulstra successively announced three different margins: 3%, 5.6% and finally 9.7%. 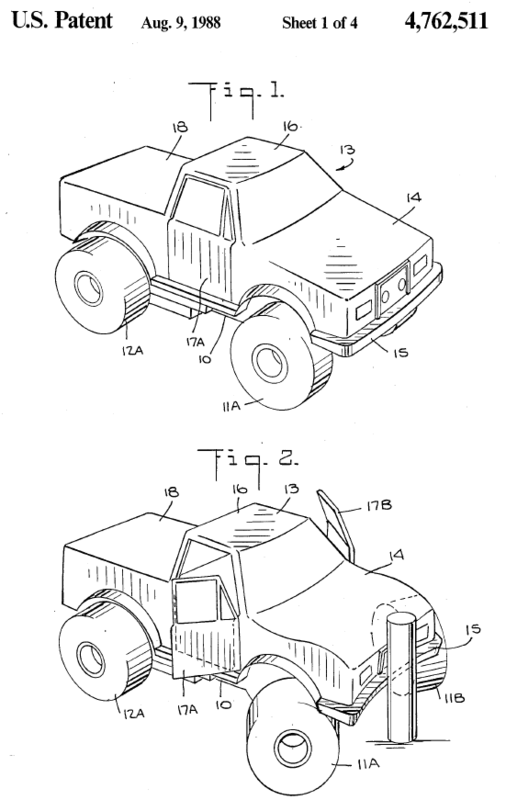 They said the first two figures were erroneous: the first one concerned another equipment, and the second one concerned all connecting rods in general and not specifically those protected by the patent. [The defendants] rightly stigmatize the behavior of Hutchinson and Paulstra, by emphasizing the contradictions in their successive statements, their inconsistency, and their lack of credibility, stating that this is due to their decision to prevent any control over Paulstra’s claims […]. The error alleged by Paulstra when the first rate of 3% was mentioned is indeed not credible, in view of the time that they took before replying to the expert, and of the importance of its “connecting rods” business. They necessarily knew what it was worth […]. Furthermore, the final figure of 9.7% was only supported by a statement by the company’s accounting director; and by a late-filed communication from an external auditor. The former was criticized by the expert as being a non-certified statement. The latter was disregarded by the court as it was too vague and imprecise, and not explicit enough. As a result, the court applied a margin rate of 3% to Paulstra’s lost sales, also noting in passing that it is “the rate generally used in this type of product in the automobile industry“. The moral prejudice suffered by the licensee Paulstra was calculated by the expert to be 125,000 euros. But the judges reduced this amount to zero. They held that there was no evidence that the defendants’ actions had harmed Paulstra’s reputation, as was alleged. It cannot be denied that a patent proprietor that does not exploit the invention but grants a license for its exploitation has the right to be awarded the profits it did not make because of the infringement. But it has to show that the alleged lost profits are real. […] [Hutchinson] relied on trade secret as the reason why no information was provided in this respect. But, during the expertise proceedings, they stated: “[…] these damages should no be calculated based on the contractual royalty that Paulstra would pay to Hutchinson. Indeed, Paulstra is only a subsidiary of Hutchinson, and it is not conventional, at least in terms of patentee-licensee relationships, to have such contractual royalty be paid between companies of a same group” […]. Since the very existence of the royalty was not demonstrated, the corresponding claim cannot succeed. Again, the claimants’ ambiguous statements certainly played against them. Half-admitting that there was no license royalties between Hutchinson and Paulstra while relying on trade secret not to say more was not a successful strategy for convincing the court that there were indeed lost profits to be recovered. Would the outcome have been different if Hutchinson had claimed the lump sum provided for in the last paragraph of article L. 615-7, which cannot be less than the royalties the infringer would have paid? I tend to think so. Hutchinson was nevertheless awarded 60,000 euros (as estimated by the expert) in terms of moral prejudice. It is indeed generally accepted that patent infringement necessarily causes moral prejudice to the patent proprietor because the invention is depreciated. On the other hand, Hutchinson lost again when they claimed the profits due to the infringers’ investment savings. They estimated such profits to be equal to 5% of the defendants’ connecting rod turnover. But the court held that the profits made by the defendants had already been taken into account in Paulstra’s damages; and that the claimed percentage, allegedly based on Hutchinson’s own spending, was not credibly substantiated, since it seemed to include other activities than those related to the patented invention. In summary the total damages award for Hutchinson and Paulstra is 652,003 euros. Was the so far 11-year long litigation worth it? Of course the damages award is only part of the answer, as the claimants did get a permanent injunction which after all is the actual weapon of mass destruction in a patent war. Anyway, the case strikingly illustrates that damages assessment is an endeavor of its own, sometimes underestimated by litigants. Just like for the assessment of validity and infringement, the court wants to see convincing evidence of whatever is asserted by the parties and will not satisfy itself with unsupported statements, let alone ambiguous ones. CASE REFERENCE: Cour d’appel de Paris, Pôle 5, chambre 2, February 12, 2016, Hutchinson & Paulstra v. CF Gomma Barre Thomas et al., RG No. 09/13793. AstraZeneca holds European patent No. EP 0907364 directed to a sustained release formulation of the drug quetiapine, which is useful in the treatment of schizophrenia. This patent has been litigated for years in a number of EPC contracting states. As far as I understand, in the majority of (but not all) cases, the patent was found invalid by national courts (see by way of example relevant blog posts here and there). With a ruling issued on July 1, 2016, France has just joined the list of countries in which the quetiapine patent has gone quiet. U.S.-based generics company Mylan filed a nullity complaint in front of the Paris Tribunal de grande instance (TGI) on April 28, 2015, requesting revocation of the EP’364 patent. This was part of Mylan’s preparation for the launch at risk of their generic version of AstraZeneca’s patented drug, Xeroquel LP. The first boxes of generic quetiapine were marketed during the week of September 14, 2015. By that time, AstraZeneca had already counterclaimed for infringement of the patent. On October 6, 2015, AstraZeneca boldly requested a preliminary injunction (PI) in front of a different court, namely the Lyon Tribunal de commerce, on unfair competition grounds. They were initially successful. The injunction was in place for a little bit more than one month, before being lifted by the Cour d’appel. This interesting aspect of the litigation was already discussed in detail in a previous post. Finally (at least for now), in a judgment handed down on July 1, 2016, the Paris TGI revoked the French part of EP’364 for lack of inventive step. This is 14 months after the filing of the complaint, which from a timing standpoint is a great outcome. Another great outcome is that, whether you agree with it or not, the court’s inventive step reasoning is very thorough and well argued. Quetiapine as a drug for treating schizophrenia was known from the prior art, and in particular from an earlier AstraZeneca patent EP 0240228. Mylan’s case was that it was obvious for the skilled person starting from this earlier EP’228 patent to come up with a sustained release formulation of the drug, in view of the well-known advantages of this type of formulation, such as a more controlled diffusion of the active and a reduction in the number of daily doses to be taken. AstraZeneca developed a number of arguments as a defense. First off, they said the court should apply the problem-and-solution approach. Accordingly, the closest prior art was not the EP’228 patent but rather a scientific paper by Hirsch & Casey describing clinical trials conducted with an immediate release formulation of quetiapine. As a result, the objective technical problem was not the provision of a sustained release version of quetiapine, but more broadly the provision of an efficient anti-psychotic drug treatment. However, the problem-and-solution approach is only one method of reasoning which can be used, but not the only one, to assess the validity of a patent with respect to the inventive step requirement. In the present case, the reformulation of the technical problem suggested by the defendants relates to an artificial approach, the purpose of which, by broadening the scope of the technical problem, is to make the patent’s choice to look at a sustained release quetiapine formulation appear inventive. The court’s statement on the problem-and-solution approach is a reminder as a matter of principle that French courts are not bound by the EPO guidelines and case law. That being said, in practice, most judgments issued nowadays draw inspiration from the problem-and-solution approach: a starting point and a technical problem are defined, and the question of obviousness is analyzed through the lens of this technical problem – which is the very framework of the problem-and-solution approach. The present case is no exception. It is well known that the formulation of the technical problem is critical in the assessment of inventive step. AstraZeneca proposed to get rid of the notion of sustained release in the formulation of the technical problem. To some extent, this makes sense as we are not supposed to include any pointer to the solution in the formulated problem. But the issue was that the patent at stake itself formulated the technical problem as providing a sustained release formulation of quetiapine. The reformulation proposed by AstraZeneca was thus considered self-serving and ex post by the court. To put it otherwise, by arguing that the closest prior art should be a document concerned with an immediate release quetiapine formulation, the patent proprietor attempted to focus on a starting point suggesting a different direction from the one chosen in the patent, and therefore one that would almost necessarily lead to a finding of inventive step. The court did not agree. First, an “efficient anti-psychotic drug treatment” (i.e. the problem offered by AstraZeneca) already existed at the priority date. Second, a press release by the patentee before the priority date implicitly suggested that sustained release formulations of quetiapine were being investigated. Therefore, the realistic technical problem was the one originally mentioned in the patent, namely the provision of a sustained release formulation of quetiapine. With that in mind, the prior art was replete with descriptions of sustained release formulations of other drugs similar to the sustained release formulation of the EP’364 patent. Whether satisfactory bioavailability could be achieved with a sustained release formulation. Whether the size of a sustained release quetiapine tablet or pill would be acceptable or too large, leading to improper absorption and travel through the gastrointestinal tract. the travel of a sustained release drug through the gastrointestinal tract is very different since the extended delivery time results in the delivery taking place in downstream areas of the digestive system, with different pH, metabolic and bacterial environment conditions, which has an impact on the release of the active substance, its metabolism, and the permeation of the active substance through the intestinal wall. Sometimes things can get messy in the GI tract. The necessity to increase the dose of quetiapine when switching from an immediate release formulation to a sustained release formulation was not proven. In fact the opposite was generally true based on pharmacology textbooks. Even if a larger size tablet had to be achieved, it was also possible to divide a single dose into two doses to be taken simultaneously. The half-life of quetiapine was already documented at the priority date and was compatible with a sustained release formulation. The undesired effect of pH on the release of the active substance was only shown in a post published document (which would not have been taken into account by the skilled person). The extent of the undesired effect was debatable in view of the declarations of the patentee’s own expert in the British litigation. And it was known by the skilled person how to thwart this pH effect by adjusting the drug formulation. The prior art taught that quetiapine bioavailability increased linearly with an immediate release formulation. It could be concluded from this finding that the disruptive effect of first pass metabolism emphasized in AstraZeneca’s submissions was at best limited and was not an obstacle to a sustained release formulation. In other terms, there was no prejudice against a sustained release formulation of quetiapine, which the skilled person was able to achieve with routine testing. It can be derived from the judgment that the court at least partly based its findings on the British litigation, and in particular on the statements of an expert who took part in that lawsuit. One last argument dealt with in the judgment is that clinical trials performed after the patent grant showed an improved bioavailability and broader therapeutic indications with the sustained release formulation than with the immediate release formulation. But the court held that the improved bioavailability resulted from routine optimization and was not surprising; and that the broader therapeutic indications could not be relied on as they were not addressed in the patent. The take home message is probably that if inventive step rests on obstacles or prejudices, those have to be very fully and convincingly demonstrated. The burden of proof lies on the patentee and based on the decision at stake it is a relatively heavy one. There are two interesting side issues in the judgment. First, Mylan claimed that AstraZeneca was guilty of unfair competition because they had warned customers about risks of infringement related to the generic version of Xeroquel LP. The court rejected the claim because AstraZeneca’s communication was deliberate and objective. When it comes to competition between an original drug and a generic one, infringement can hardly be challenged. It disappears if the patent is held invalid, but until the invalidity judgment, it is legitimate for the patent proprietor to defend its patent monopoly. Besides, the circular letter sent to stakeholders mentioned the existence of a validity challenge in objective terms. A generic drug manufacturer that decides to launch its product at risk before the patent on the original drug expires or is invalidated cannot blame the patent proprietor for defending its monopoly with its customers. Besides, the fact that the patent was finally revoked in other European countries does not result in a lesser legal scope for the French part of the patent as long as it is valid. The second point of interest relates to the PI obtained and enforced by AstraZeneca during approximately one month. Mylan claimed and obtained damages in relation with the PI, pursuant to article L. 110-10 of the Code des procédures civiles d’exécution. The damages award amounted to approximately 200,000 euros – which was however much less than Mylan had requested. Part of the award was calculated based on an evaluation of lost sales, to which a margin of 30% was applied. The other part corresponded to a loss of opportunity in relation with a public tender from which Mylan had been excluded due to the PI. On the other hand, the court did not take into account the alleged harm suffered in terms of sales of other products or in terms of image injury, in the absence of convincing supporting evidence. Finally, reimbursement of 300,000 euros of attorney’s fees were requested by Mylan. The court granted half of it. It remains to be seen whether there will be an appeal decision, given that it may prove difficult for AstraZeneca to obtain it before the expiry of the patent on May 27, 2017 (no SPC was filed, as the judgment tells us). CASE REFERENCE : Tribunal de grande instance de Paris, 3ème chambre 3ème section, July 1, 2016, Mylan v. AstraZeneca, RG No. 15/05880.